Protecting glassware is a must whether you are shipping to a new address or preparing for long term storage. We have the industry’s best tips on keeping your glassware safe! Each box you use will need a buffer on the bottom to avoid any injury to your glassware. Fill each box an inch or two with any material that will guard your glassware. Anything from bubble wrap, extra linens, newspaper sheets, packing paper, or packing peanuts will serve as a great buffer for your items. The best way to protect each item is to first wrap in paper, then multiple layers of bubble wrap and secure with tape. Ideally, every box will hold only one item however that is not always feasible. If the items must be stored together, always stack the heaviest item on the bottom. Use cardboard or extra linens in between items to prevent any cracks. Once your glass items are in a box, fill each box with more packing material. This may include crinkle paper, newspaper sheets, packing peanuts, etc. Make sure to leave room at the top for extra packing material. This ensures the items will not move around during the move. Once each box is filled, secure the box and give it a shake. If you hear any movement, you will need to open and continue filling with packing material. For additional security, place the box into a larger one filled with packing material to ensure the smaller box will not move. Do the shake test once more to confirm the item is secure. Now that everything is secure, you need to make sure these boxes get handled with much more care than any of the others. 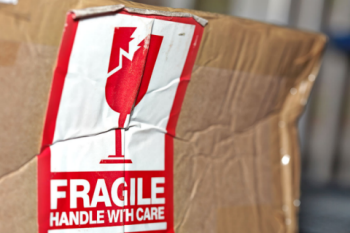 Label with clear and bold letters “FRAGILE” so everyone knows how to treat these boxes. It is also a good idea to place a brightly colored label saying “DO NOT STACK” to avoid miscommunication. Stacking these boxes is the best way to break your glassware, even if your box has extra padding in it. Additionally, labeling the box with how much of what is inside may be helpful to account for all items especially when using a third-party moving company.